I cannot thank you enough for the terrific advice and for taking the time to snap the pics earlier this morning. I would have never considered a non O-Ring chain and it adds yet another possible addition to my list of minor modifications for a Project bike. Now that I know a 16 “can” be installed and I am assuming a 38 can be installed in the rear without tearing up the chain guard and swing arm hopefully, I based my latest RPM/MPH around the stock 140/70x17 BW. When I did the calc’s for an upsized 140x80x17 rear tire, the ability of the .25 L to run at just 5K while pulling 66 mph seemed really suspect so I dropped it. Using the stock rear wheel/tire combination, the result yielded 4K at 50 mph and 5K at 63 mph in 6th. I am guessing but the WRX should be able to drive the bike to 55 + mph at approximately 4,500 RPM with a minor head wind from right rear quarter through a straight on head wind to a left rear quartering wind in the flats? And a gear or two drop for any higher speed slab, higher headwinds and inevitable climbs over the Rockies and Sierra Nevada's if I were to take this bike out West of course. While it is your bike and your money, and what you do with both is entirely your affair, the entire project seems lost on me, even if I was all about "hypermileage". You're looking at doing this to a platform bike that is carrying a lot of extra weight in front and rear suspension to make it capable of aggressive riding (within it's dual sport usage) - a use that is diametrically opposed to obtaining high mileage. Not to mention it's tall, no windscreen or fairing, etc. It's roughly like trying to get high mileage out of a Dodge Viper. There are already high mileage two wheeled vehicles out there already. Most are of much less displacement; the best are commonly referred to as "scooters". 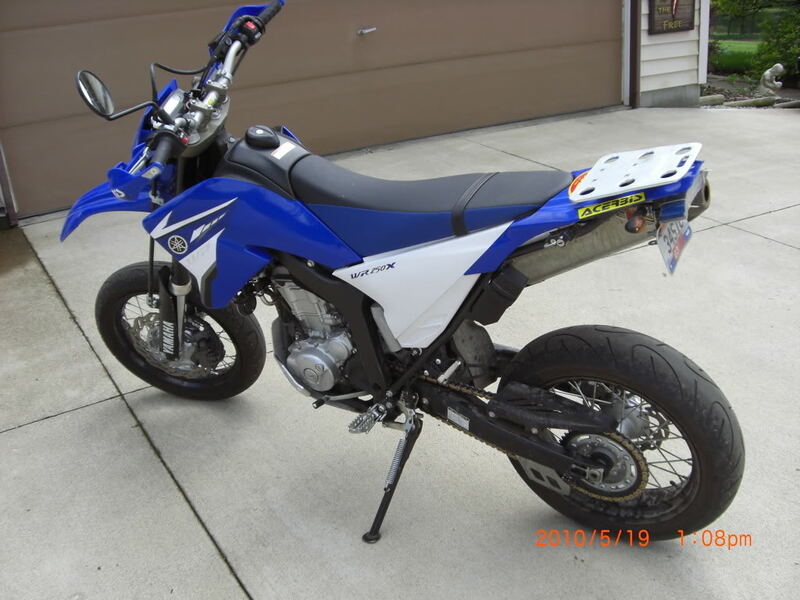 A WR250 will never touch them for mileage capability. Given that 6th gear is already so tall that it is frequently useless (I can't pull even a moderate hill at highway speeds in 6th gear without lugging the crap out of the engine), it seems to me the gearing you are proposing is going to leave you with useless gears. This is a motor that likes to rev to make power, and your gearing would have 55mph coming from 4300 rpm. Will the bike maintain 55mph at 4350 rpm in 6th gear? Even without the smallest of headwinds? And do it economically, without having the throttle to the stops to try and get it to 55mph in 6th gear? Ummmm... maybe, but I doubt it. I suspect you might be reaching down to 4th and 5th - just to get the equivalent of the stock setup. Anyways, sprockets are relatively cheap, as is chain. May as well go down a chain size while you're replacing sprockets. It's not like you'll be putting a big load on the chain or anything while striving for hyper mileage. Thanks for your input and I can only speculate as to the WR’s capabilities given my SF experience in LA a few months ago and my less than 5-minutes on a WR while riding through VT on an F 800 GS about this time last year. I will tend to disagree with your assessment regarding the WR’s capabilities and especially when it comes to comparison to a scooter. Taking a scooter off-road or down the Interstate is not what I consider a worthwhile endeavor. I do however know of a couple out of Olympia Washington that will be taking a Vespa GT250 around the country on a 5-week adventure ride beginning this May! Currently, Kawasaki is considering shipping an S into the Midwest for a long-term review and then allowing a 100 mpg Adventure Tourer project bike to be created afterwards. I will have to return it back to OEM stock afterwards of course but have my fingers crossed given Yamaha has not responded back as of this writing. Meaning it may be later this fall during my next scheduled trip to LA before I will be able to ride a WR/WX possibly? I reviewed the SF on a somewhat lengthy section of I-5 heading out of LA w/ > 100 mpg results and its less powerful engine in sixth gear is geared slightly taller than the WR and WX in OEM configuration according to the back of the envelope calc's and tech specs. With some work, the OEM lower geared WR “may” be capable of nearly matching the S/SF’s FE with a its g/kW fuel consumed/per given output at partial throttle (BMEP) being a little more expansive thanks to the more modern EFI equipped mill. In addition, the project bike would include more yet still very minor fuel saving and ergonomic additions then the items you described above. As we all know, beating oneself out on the slab for 10 + hours a day with a naked dual sport and OEM seating is not for the faint of heart. I am a touch over 6’ myself and the WR with its tall legs may be one of the most potent Adventure Tourer’s available when it comes to a small environmental footprint along with its reliability and ability to transport oneself to locations no one has ever tread before. 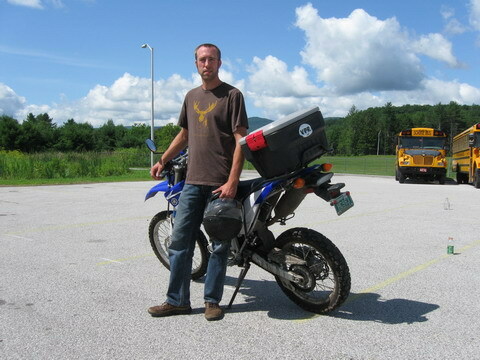 Reading some of the thousands of posts from the WR/S owners in the WR, S and ADV forums is a testament to the WR/S’s capabilities vs. the much larger displacement Asian and European Dual sport and Touring bikes I have ridden in the past. BMW has their GS bikes tuned for an over the top amount of HP while offering excellent range thanks to both large capacity tanks and engines that are as efficient as they are desirable (F 800 GS – 85 HP at the crank and 62 mpg at a steady state 55 mph) but you have to pay the piper to play in the big displacement realm and there is no chance for 100 mpg vs. the WR’s prospects along the same route. I cannot wait to ride a WR/WX for a lengthy period given the interesting online discussions you and others have had and contributed to over the past few years. As I typed this up, some farkles arrived in the form of an Open Loop - Great Basin Saddlebag + Fandango Tank Bag. The most aerodynamic yet large capacity soft bags I could find. Thank you Harold Cecil of Open Loop! I seem to remember a fabulous walkthrough on changing your front sprocket somewhere (here? monster thread? 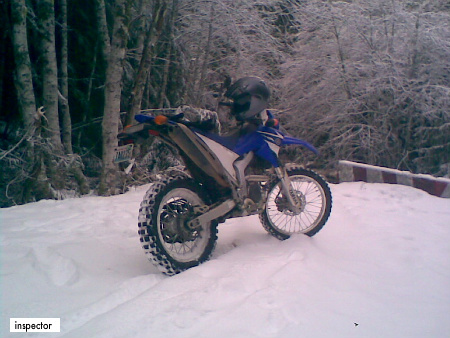 wrrdualsport?) but can't seem to find it. It all seems simple enough but I'm stuck on removing the drive sprocket nut - I assume I need to pull those indentations out, any tips on how to do that? If I have an impact wrench, will I be able to take it off w/ it up in the air or I assume I need to lower it to the ground so the rear wheel can fight the torque. Hey gang, another basic question from a guy new to chain drive bikes. . . I swapped out the stock rear sprocket and the chain and in do so I had my first introduction to mounting a rear wheel on a chain drive bike, which of course involves aligning the wheel/chain and setting the chain tension. 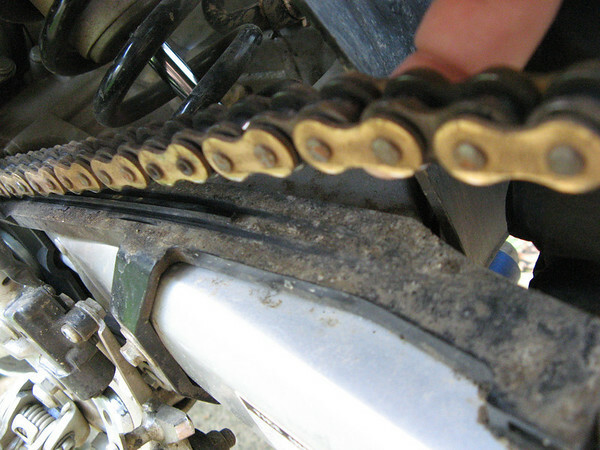 - Is it normal for the chain guide to wear? - What do we watch for to know if all is healthy or if something is out of adjustment? - If they do need to be replaced (routinely or b/c I messed up my chain tension or alignment), how do I know when to replace? Thanks all. One day I'll offer more than basic questions, I promise! Your guide has normal wear; they will do that an usually stop at a certain point. A good indicator is your chain; watch how much of your chain gets shiny. The bottom of it is shiny from where it glides over the slider...but if it starts showing anywhere onto those rivets I'd be replacing it. You don't want it digging into your swingarm (that happens up front) and you'll usually see fine silvery stuff all over your chain and your slider. Usually that's due to improper chain tension, so just make sure you're not running it loose. JTF1590-12 is the part number if you want to go with a JT 12T. You can run up to a 45T rear as well and still be able to use the stock chain. 45t part number, is there a site for best prices that would have both? You'll need 110 links for 12/48, and I found this out when I had 12/48 on my WR-250R. I haven't tried a 110 link chain with 13/43, though. 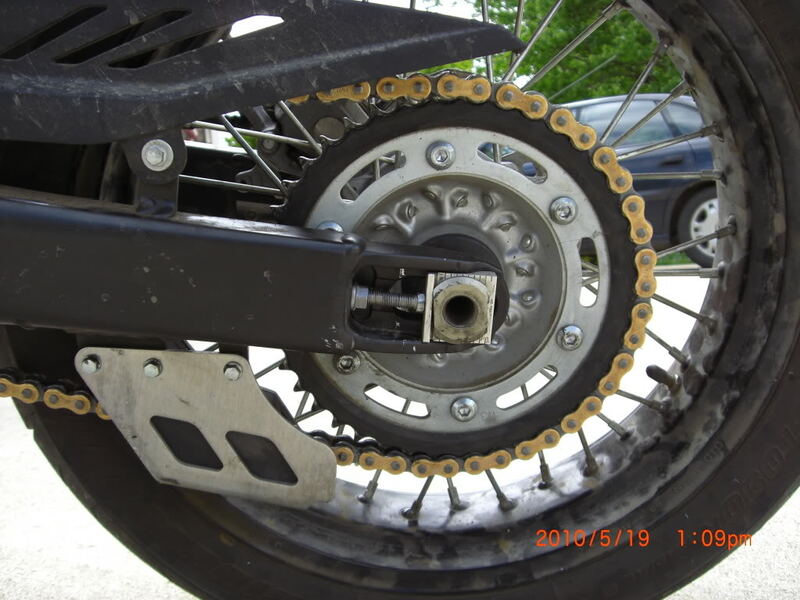 Aluminum vs. steel rear sprockets? Is the wr torquey enough to damage the aluminum sprocket ? I understand the weight advantage of the aluminum, but is there an advantage to steel? Is there a speed healer for this bike?? Shoot Brooks a PM and he'll set you up with one. can I use oem bolts on this? Its official, a 110 will hold a 13/43 setup. In fact, it will also a 12/43. There is not much room left for adjustment though. I have not thrown the dirt wheels on yet to see how the 48 tooth will fit. Too excited to finally get the bike on the road now that it has stopped raining for an hour. I've managed to power wheelie my WRX off the line at lights a bit with my 13/47t setup. I wonder how much that 50t steel sprocket weighs. It must be pretty heavy. I like the weight of my Vortex Alloy 47t, but of course it is wearing faster than desired. Chromoly steel is very strong, much stronger than aluminum and it will certainly out-last a comparative aluminum sprocket. I will be ordering it here soon once I decide on what I think will be the best gearing setup with the turbo (I already picked up a Renthal 14T front). Currently the bike has a stock front and a 45T GYTR rear, adding the 14T to it still won't even make it equal to the stock ratio and I will certainly want a setup that's taller than stock. Don't forget that the teeth on the sprockets are all the same size and the teeth are usually the first to go. to put on a set of Mitas (100/100-18) will report back what I find. Perfect now on and off road here at altitude. I think that's a definite yes. But I would think you can just gently Dremel some of the rear of the guard away. It shouldn't take much to let it clear it, and add a little more for the chain jumping around. I just installed a 50 Tooth & the chain is binding on the chain guard -- do I need to do a mod? 12/48 is excellent for trails and such but it screams pretty good when road riding. My 12/48 is on an X with street tires. I just like the bike to be quick more than fast. I find the bike to be squirrely after 90 MPH anyway. And in town in Austin, 70 MPH is fast enough. You won't believe how it wakes the bike up from stock gearing. I thought of Xcel and imagined that's what his gearing feels like in 1st. I finally put some good miles on my new 13/47 combo. I have to say, I really like it. I lost some top speed on the highway (doesn't feel great past 65 now), but it REALLY woke the bike up in the first 3 gears. 1st is now basically starting, 2nd is anything slow and technical, and 3rd rips up fire roads all day. I'm digging this combination a lot. As a side note... my new tires (Mitas) are SUPER squirrely on the highway once I past like 50mph, so 65mph is all I'm really going to try to get out of her.